Backstitch is a hand sewing stitch that is useful for when the stitches will not show on the right side of a garment or project. It is an excellent hand stitch to sew a seam because it is one of the strongest and most redundant stitches, making it very reliable. Use this stitch for mending seams, hand sewing small projects or hand-picking a zipper in a beautiful garment. The sample backstitching uses contrasting thread for visibility. In normal situations, you should sew with a thread color that matches the fabric color. You can use the same kind of thread you would choose for machine sewing, but it's good to look for threads designed for hand sewing. Hand quilting thread, for example, is strong and good for hand sewing like this. Thread a needle with a piece of thread no longer than a yard long. Longer pieces of thread tend to get tangled and knot as you sew. As tempting as it may be to start with a long piece of thread so that you won't have to stop and re-thread the needle, you may pay for it many times over with knots. Work with the thread 18 to 24 inches long by pulling the tail of the thread at the needle area and shortening the doubled area as you sew and use up the thread. For extra strength, double the thread and knot the two ends together. This way you have two lengths of thread, giving the seam some backup. Knot the end of the thread with a large knot that won't pull through the fabric. Start the knot in an inside area (usually a seam allowance) near where you want or need to start sewing. To keep your seam as straight and as tidy as possible, it's helpful to mark the line of stitching with a thin pencil line. On straight seams, use a ruler. For curves, measure the seam allowance and make short marks along the seam and then connect them so you have a guide to follow. Push the needle into the fabric where you want to start the seam or joining two pieces of fabric. Bring the needle back through both layers of fabric just in front of the previous stitch for the strongest backstitch. Stitching in this fashion resembles a machine sewn stitch. Push the needle back into the fabric between where the needle came in and out of the fabric to create the first stitch. These stitches can touch each other, as you see here, or you can space them a little farther apart. Once you've sewn a distance, you will see that the threads overlap on the reverse side of the fabric. Take your time and sew small stitches for a secure seam. For example, a garment seam such as a crotch seam in a pair of tight pants requires a strong reliable seam. 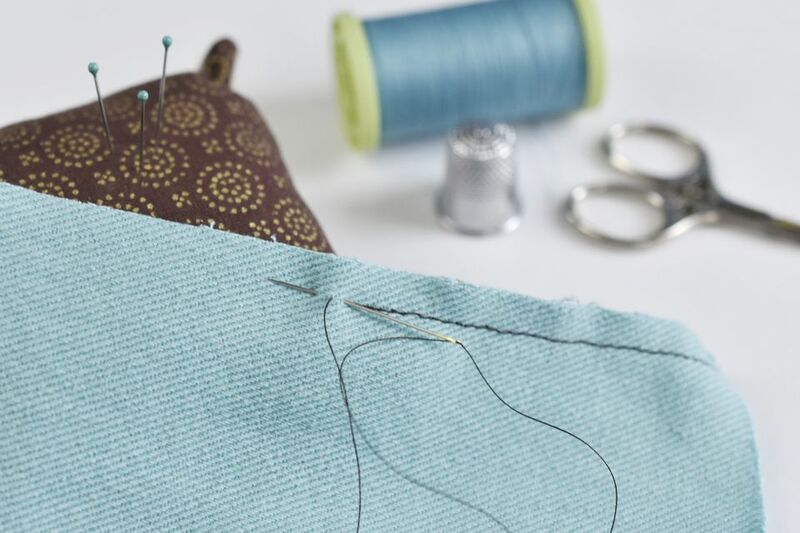 For other kinds of sewing projects, small stitches still work, but you can make them a little longer if you want to stitch faster. Adjust the length of the stitch for the look or effect you desire. For example, you would use backstitch on a hand-picked zipper, but the length of the stitch is tiny so that it is barely visible.